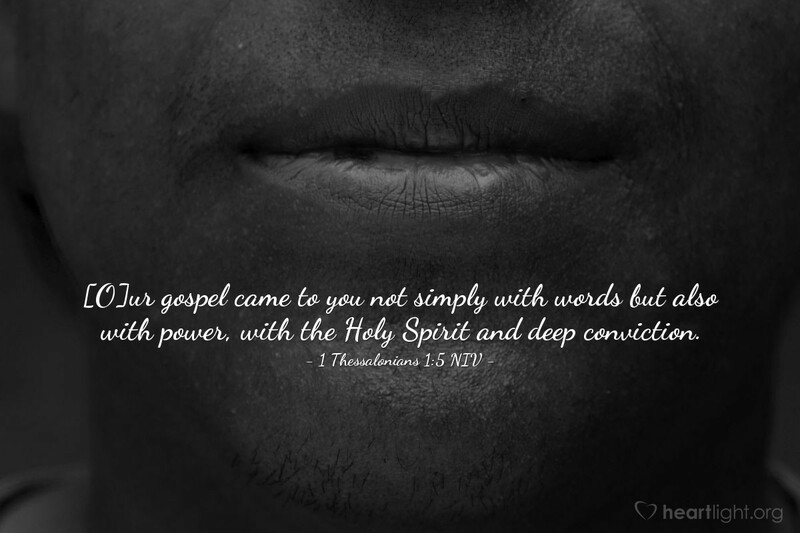 [O]ur gospel came to you not simply with words but also with power, with the Holy Spirit and deep conviction. When the gospel of Jesus is proclaimed, much more is happening than just the declaration in words of God's grace in Jesus. Not only did the Holy Spirit inspire the truth of God's message in Jesus that we find in the Scriptures, but the Spirit is also at work in the proclamation of that message today. The Holy Spirit is at work in this proclamation bringing conviction of sin (John 16:7-11), capturing the hearts of people with the story of Jesus (1 Corinthians 2:1-5), and opening people's minds to understand God more fully (Ephesians 1:17-20). When we think of times that the message of Jesus was powerfully proclaimed and we felt moved in powerful ways, too often we think that what we experienced was the result of a great speaker. But Paul admitted that he wasn't a great speaker and reminded folks that the power of the message he proclaimed was rooted in the Holy Spirit as the source of that message and in the Savior that the message proclaimed. Let's never forget the Holy Spirit's power behind the message of Jesus. Forgive me, dear God, for the times that I have underestimated the power of the message of Jesus to transform human hearts. Forgive me for not praying for those who proclaim this message. Forgive me for not praying to have that message work powerfully in my heart. Open my eyes to see the Holy Spirit's power at work in the declaration of the message of Jesus, and may your power and blessing be on those who proclaim that message. In Jesus' name, I pray. Amen.